Humans began making art 40,000 years ago. Why? Over the course of his career, White has studied the majestic cave art that began to appear in the human cultural record some 40,000 years ago – the same time, he argues, that the first Homo sapiens arrived in what is now Europe and were confronted with another bipedal, intelligent homonin species, the Neanderthals. Was making art critical to the social cohesion that enabled our early human ancestors to make the transition into the European continent? “It may well have to do with art's role in society creating the capacity for social solidarity, for identity, for people seeing themselves as part of the same population,” says White. In this conversation with Smithsonian Second Opinion, White explores the earliest instances of art from ancient peoples, and why, after more than 250,000 years of existence as a species, humans began creating expressive art. Has there ever been a society without art? There were human societies without art—when you go back to before 40,000 years ago. Anthropology asks the larger question: Is art innate to the human brain or is it a cultural invention? That's a pretty critical question. It's one that drags a lot of debate these days about whether Neanderthals did or didn't have art. And if they didn't, is it because their brains were different from ours or is it because they just hadn't invented it—just like medieval people hadn't invented the automobile. It also raises the other question of how do we differentiate humans? Did humans exist before 40,000 years ago? Did they exist 100,000 years ago? Did they exist a million years ago? What's the benchmark? How do we, how do we define humanness? Do we see the kind of artistic behavior that we see now in modern humans around the world in the first human populations? Well you see some evidence: One of my claims to fame is an expertise in personal ornamentation, jewelry, ornaments, that sort of stuff. You see some of that stuff show up as early as 200,000 or 300,000 years ago. But it's very intermittent, and we certainly have absolutely no evidence of what most people would think is the origins of art. 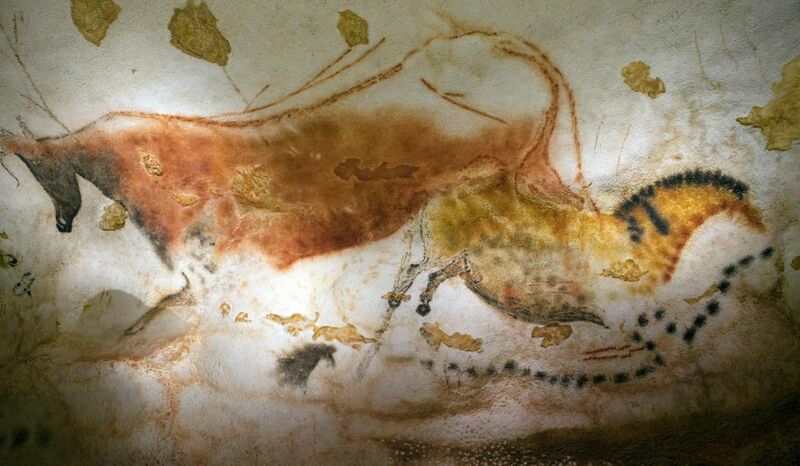 When people think about Lascaux [cave paintings in France dated to about 17,000 years ago], they think about painting, engraving, and graphic representation, that sort of stuff. None of that happened before then -- even though the heads [of those ancient people] looked like ours. Their skulls looked like ours – but they are not doing this kind of art. What about the 2010 discovery in Africa of artifacts with graphics that looked to be older than 40,000 years? Yes, the dates are in the 50,000 years ago range, maybe as early as 60,000. They are fragments of ostrich eggshell, which are interpreted as having been used as water gourds -- based upon the way the people today use ostrich egg shells -- and that they were decorated with geometric patterns. If we’re willing to consider that these people were anatomically and neurologically human, it really raises the interesting question about just how innate art is. Your research suggests that art had a certain utility as part of its origins, in terms of personal ornamentation. Is that how art got started, do you think? Back in the '60s and '70s, Paleolithic archeologists considered art as just kind of the cherry on the cake if you like—art wasn't considered to be evolutionarily important. It's what you did if you had time to do it, but it really didn't serve an evolutionary function; it had no adaptive value. I think we've gone very far from that to a position today where we think that symbolic behavior is absolutely critical to the way that human societies interact and are structured. From most art historians and connoisseurs point of view, art is all about ingenuity, it's about individual creativity, it's about inspiration, it's about a lot of other things that we anthropologists certainly have trouble relating to. Because we can see when art emerges, and that art emerges in particular circumstances in terms of the interaction between competing populations. So for us it's not a great leap to think that art is functional -- it has adaptive value. What made people start making art to adorn themselves? The answer to that question is not a trivial one. It's because these ancient people were taking time out of their lives to make these things, and to organize them in very complex arrangements. They could be doing something else, such hunting and putting food in the larder and the fact that they're not. There is an ancient burial site in Russia called Sunghir, and there are three people who were buried with 17,000 ornaments on their bodies. Each of those ornaments takes three hours to produce, so that’s 51,000 hours of labor that goes into what they're putting on people's bodies. That suggests that, even to them, there's an importance of these kinds of things. So these caves were special places, even for the humans who lived at that time? They weren't living in these caves as like dormitories or something? They're not. There are very rare cases where we found evidence of fires and things, as much as maybe a couple hundred meters underground. But for the vast majority of them, people are not living in these places. At Chauvet [a site of cave paintings in France dating back to 30,000 to 32,000 years ago, there are a small number of fireplaces, but they seem to be fireplaces for two things: a small amount of light that allows them to paint or producing charcoal to make the pigments that they're putting on the walls. You can count on probably the fingers of two hands the number of actual bone remains that are related to actual human consumption in Chauvet. What did the handprints found in these caves represent? These people were putting their hand on the wall and they're basically spitting pigment over top of it. It's like a prehistoric version of a spray can. There is a cave called Gargas in the foothills of the French Pyrenees, in which there are something like 260 [hand stencils] on the wall. One part of the cave has only red ones; one part of the cave has only black ones. They're placed in very strategic places in the cave. At Gargas, the situation is even more complicated by the fact that they're holding their fingers back to make different configurations of the human hand. It suggests some sort of signaling system, as in, “Hold up three fingers if it is a reindeer” or something like that. It's probably much more complicated than that. There don't seem to be alot of depictions of humans in cave paintings, what’s the theory about why? There are a certain number of humans represented on cave walls but they tend not to be particularly well done or dominant by any stretch of the imagination. A cave like Les Combarelles, for example, has 700 images of mammals in it, and there are perhaps ten images of humans. And they are rendered in a way that doesn't look at all like the way they're rendering animals. That said, when humans are represented, they are represented in extraordinary complex ways. There are sculpted female representations from virtually the entire Paleolithic period. They depict pregnancy -- I think they're about the mystery of life, about where humans come from. Humans in the upper Paleolithic period found a way to materialize it in imagery and sculpture. It's trying to come to terms with the mystery and the power of woman being able to give birth. When we see depictions of animals appear in ancient art, what does that tell us about how ancient humans lived? Spear throwers are a particularly interesting example that gives you an opening into how complex these [discussions] are. They are propulsion systems that enabled people to throw spears at great accuracy and velocity. But it’s ironic that they're adorning these tools with these very peaceful scenes of animals. It isn’t an image of an animal that's suffering or panicking or in flight. It's very calm and peaceful. It suggests that there is a relationship between hunting and death and what people thought about animals and their spirits. 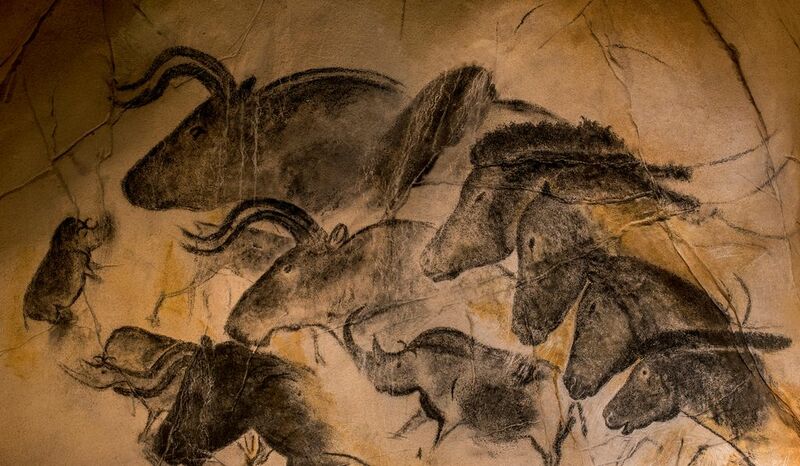 Even as early as Chauvet, the animals that people are painting are not the animals they are hunting. They're painting animals that almost never show up in the food debris. They are animals that have some importance in their lives in terms of ancestors or spirits or what have you, but it is not at all about hunting and diet. Lascaux is the classic example: There's something like 1,000 animals on the walls at Lascaux, and the food debris on the floor of the cave is 90 percent reindeer. There isn't a single reindeer on the walls of Lascaux. Not one. There is a big mystery of art: Many anthropologists argue that humans have been anatomically and neurologically the same for the past 300,000 years. And during most of that time archeologists see the same kinds of tools being made – flaked stone chips and spears. And then some 40,000 years ago, you start seeing all kinds of tools appear, and an explosion of cave art, sculpture, and personal adornment. Scientists used to call this the “culture explosion.” What might've triggered this behavior? And the question is, what does art have to do with this? Why in the world would an incoming population of invaders who previously didn't have this kind of behavior -- why would they create it? Why would they invent it in a colonization event? And it may well have to do with art's role in society as creating the capacity for social solidarity, for identity, for people seeing themselves as part of the same population. We tend to think in evolutionary terms of people succeeding because they are better hunters or better collectors; they put more food in their bellies. But it may well be that the key is being better in organizing yourselves and to have these kind of social mechanisms that allow you to hold territory. 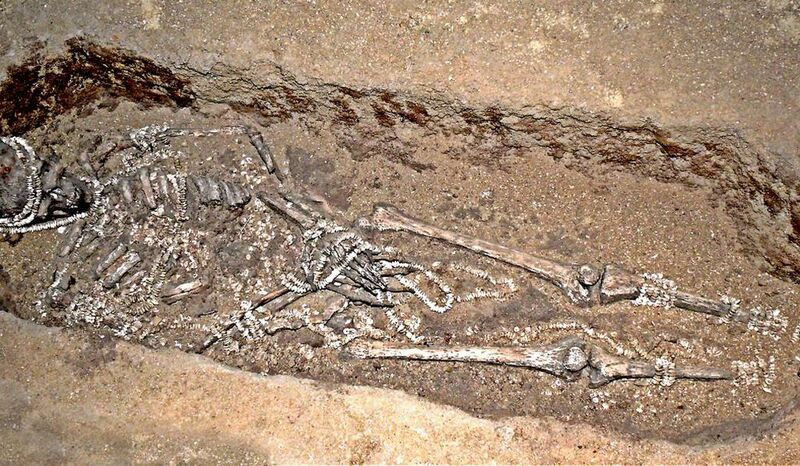 When I think of these Aurignacian people, I think of people who may never have met each other but who still thought of themselves as Aurignacian. In contrast, the Neanderthals are very local yokels. They had no sense of cultural similarity with people who were 50 or 100 miles away. That might help us to explain why people might paint an animal on the ceiling of the rock shelter that they were living in, or on a cliff face -- somewhere where they knew that some Neanderthal would see it or some other modern human would see it. It's a complex argument. But it's the argument that social and symbolic phenomenon are just as important as the kind of ways that you gain your material existence. And that these social and symbolic phenomena have an effect on whether you gain your material existence or not. With art, you have people sharing a cosmology, a view of the world, values, traditions, ancestors, what's important. It's hard to estimate how important that might be evolutionarily, but I suspect it's where we have traditionally underestimated that kind of behavior. Are there societies today that don't have art? All modern human societies have some form of art. But part of the problem is the concept of art itself. It's really problematic for anthropologists, and it has been for a long time. Art is defined by a modern art market. It's defined by connoisseurs, it's defined by a Western tradition. And that only goes back a couple thousand years. Where you really get into some interesting problems is that when you begin to investigate, for example, 18th- and 19th-century Inuit societies: They don't have a concept of art. They don't separate out what we would call art from other kinds of activities that they do. So, what do you do with objects that we consider to be art, but the people who created them don't consider to be art? Does your work in the origins of art give you a point of view on in terms of whether art should be taught in school today? When you hear about defunding art, or focusing more on teaching science, technology, engineering, and math [STEM], what does that make you think? Oh god, you're asking that question of someone who doesn't have an artistic bone in his body! I mean I grew up in the usual sort of grade school situation, learning how to draw or whatever. It's really not my thing -- but it is my thing from an evolutionary perspective. If all this other stuff is so important, why do you think 400,000 people a year come to visit Lascaux? Somewhere deep down, we all recognize it. And while STEM might be important, art is this other thing that really drives us.